Grigor Dimitrov is now 14-1 in 2017, and after two ATP titles already this season, he’s on the cusp of a top 10 ranking. 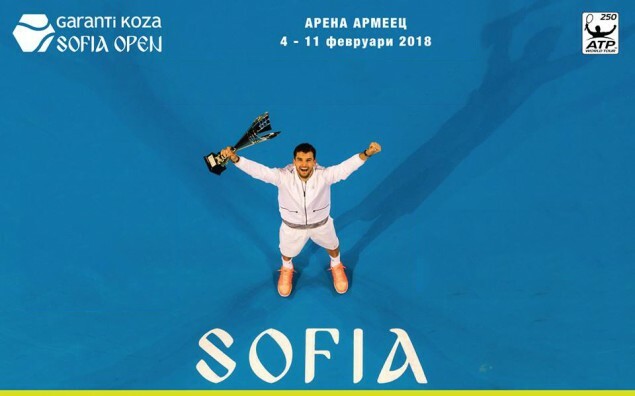 The Bulgarian #1 had a memorable run in Sofia, playing in his nation’s only ATP tournament for the first time. With home fans united behind him, Dimitrov continued his aggressive ball striking and in-form serving en route to a 7-5 6-4 victory over an overwhelmed David Goffin in the final. The title is number six in Dimitrov’s still young career, and by far the most special for him. Having found his focus, the Bulgarian looks sure to do damage on bigger stages in the weeks to come, such as the two ATP spring Masters tournaments in North America. Dimitrov got off to a shaky start against Jerzy Janowicz and was in danger of making an early exit, but he won that match in three sets, and proceeded to buzzsaw past Viktor Troicki and surprise semifinalist Nikolosz Basilashvili, a rising Georgian player who lost every game of the first set, and a couple of games into the second set before winning his quarterfinal match over Martin Klizan in three sets . Goffin dropped sets against Radu Albot and Roberto Bautista Agut, with a straight set win against countryman Steve Darcis inbetween them, however he showed some great tenacity this week and is also flirting with a top 10 ranking. Should the Belgian continue to win the matches he’s supposed to win, he’ll be in the top 10 again. Serbians Viktor Troicki and Nenad Zimonjic beat Mikhail Elgin and Andrey Kuznetsov in the doubles final. Victor Estrella hails from the Dominican Republic, but when he’s found a second home in Quito, Ecuador, where he has taken all three of his career ATP titles, and won all three editions of the Ecuador Open. His third triumph at altitude came in a nip and tuck final against fellow veteran Paolo Lorenzi, that he finally won in a third set tiebreak 6-7 7-5 7-6, saving a match point in that tiebreak. Lorenzi had his chances at a second career tour level title at age 35, but the Italian faltered from a set and a break ahead. Estrella saw a chance to get back into the match, and took it, looking fit and fresh even after three close sets at 36 years old. Estrella’s other difficult match in Quito came against Ivo Karlovic, as he won two out of three tiebreaks to prevail. He got off to a slow start in the tournament, dropping a set to Andrej Martin, but after getting past Martin and Karlovic, he slipped past Federico Gaio and big hitter Thomaz Bellucci, defeating Bellucci in two tiebreaks. Lorenzi looked more solid all week until midway into the second set of the final. The Italian challenger legend scored ATP wins over Matt Ebden, Rajeev Ram, and Albert Ramos without dropping a set. James Cerretani and Philipp Oswald beat Julio Peralta and Horacio Zeballos by virtue of a retirement in the second set to take the doubles title. Coming off a disappointing result in Davis Cup, not much was expected from the young Alexander Zverev, but the German triumphed against a host of accomplished ATP veterans to claim his second career ATP title at the age of 19. Zverev had to battle all week in Montpellier, as his only straight set victory came in the final against veteran Richard Gasquet 7-6 6-3. Zverev dropped sets against Aljaz Bedene, Jeremy Chardy, and Jo-Wilfried Tsonga before winning the third set in all of those matches to reach the final. Gasquet played well in wins against Malek Jaziri and Benoit Paire, Kenny De Schepper tested him in between those matches, but in the end the Frenchman with the magical backhand reached yet another ATP final in his accomplished career. After a run to the final on home soil, Gasquet looks set to return to the top 20 soon. The Zverev brothers claimed double joy in Montpellier, taking home the doubles title over France’s Fabrice Martin and Daniel Nestor. Along with it being rare to claim an ATP singles and doubles title on the same day, the Zverev brothers are the first brother pairing in a while to take a doubles title, besides the Bryan twins. Richard Gasquet successfully defended his Montpellier title, taking a third trophy at the French tournament, and showing no signs of back problems in the process. Gasquet had a relatively easy path, but had to survive a tough semifinal match against Dustin Brown, where he was 1-6 0-3 down, before the wheels came off for the streaky Brown, and Gasquet ended up winning in three. It was an all French final, as the veteran Paul-Henri Mathieu posted his best result in some time to reach the final, falling 7-5 6-4 to Gasquet. PHM beat Elias Ymer, Benoit Paire, and then John Millman in three sets, and Alexander Zverev in a tough two setter to reach the final. Zverev posting his best ever ATP result by reaching the semis. Gasquet beat powerful ball strikers Ernests Gulbis, and Marcos Baghdatis, in addition to Brown. Mate Pavic and Michael Venus beat the Zverev brothers, Alex and Mischa, to win the doubles title. Victor Estrella surprisingly repeated as champion in Quito. The 35 year old upset Thomaz Bellucci 4-6 7-6(5) 6-2, as he ground down his opponent, for a second career ATP title. Estrella beat Guido Pella, Andrej Martin, Renzo Olivo, and Albert Ramos en route to the final, losing just a set to Olivo. Bellucci needed three sets against Pablo Carreno Busta in the quarters, beat Albert Montanes prior to that, and surviving Paolo Lorenzi in a three set semifinal. Lorenzi scored his first ever top 20 win when he defeated Bernard Tomic in the quarterfinals. Carreno Busta and Guillermo Duran played doubles for the first time together and captured the title, defeating Bellucci and Marcelo Demoliner in the final. Roberto Bautista Agut continued his streak as the hottest Spanish player right now with his second ATP title of the season in Sofia. He’s the first ever champion of the Bulgarian tournament as he defeated Serbia’s Viktor Troicki 6-3 6-4. RBA only had three matches this week, as Filip Krajinovic granted him a walkover, and then Adrian Mannarino and Gilles Muller in the quarters and semifinal to reach the final. Troicki reached his second final of the season, dropping just one set in his first three matches. He handled Daniel Brands and Philipp Kohlschreiber with ease, and then had to battle past Martin Klizan in 3 sets. Wesley Koolhof and Matwe Middelkoop defeated Philipp Oswald and Adil Shamasdin in the doubles final, saving match points in the process. It was a tense week for the Dutch tandem. The first edition of the Sofia Open saw the surprise exit of the top two seeds in the qualifying draw. Headlining the field was Japan’s Yūichi Sugita. Ranked 124th in the world, Sugita recently qualified for his maiden Australian Open main draw before suffering a defeat to French 23rd seed Gael Monfils. The 27-year-old kicked off his Bulgarian campaign with a 6-4, 6-1, win over Turkish wildcard Cem İlkel. Awaiting him in the final round was Romania’s Marius Copil. Copil defeated 18-year-old Bulgarian Alexandar Lazarov in straight sets during his first round match. Copil’s start to 2016 has been far from ideal with him losing two out of his three matches during the Australian swing. Despite the unsatisfactory to the year, Copil proved too problematic for Sugita. The world No.170 fended off three break points to win 6-3, 6-4, after 78 minutes of play. Following the top seed out of the tournament was Russian second seed Konstantin Kravchuk. At 133rd in the world, Kravchuk is just seven places away from his career best of 126. His opening match was a tricky test against Belgium’s Yannick Mertens. The 30-year-old had a match point to take the win in straight sets, but failed to convert as he eventually edged past the world No.201 6-2, 5-7, 6-2. There was a bigger test awaiting Kravchuk in the second round, German fifth seed Daniel Brands. Brands has enjoyed an impressive start to 2016 with a semifinal appearance in the Noumea Challenger, followed by reaching the second round of the Australian Open as a qualifier. Despite a promising start by the Russian, the 30-year-old prevailed to Brands. The German recovered from a set down to upset the second seed 4-6,7-6(5),6-4. Mirza Basic recently became only the second Bosnian man to reach a main draw of a Grand Slam tournament at the Australian Open. In Melbourne he defeated Robin Haase in the first round before succumbing to Tomas Berdych. Basic was able to continue his Melbourne momentum in Bulgaria with a duo of wins. His opening performance against Israel’s Amir Weintraub was mixed. After failing to serve the match out in the final set at 5-4, the Bosnian grabbed another critical break in the following game to seal the win – 6-7(2), 6-3,7-5. Basic’s second round encounter was more straightforward as he eased past 6th seed Farrukh Dustov 6-3, 6-3, to reach the main draw. Completing the quartet of Bulgarian qualifiers was Italy’s Thomas Fabbiano. Since reaching the last eight of the ATP Chennai Open at the start of the year, the Italian has suffered early losses during the Australian Open qualifying tournament and at the Manila Challenger. Fabbiano, seeded fourth in the tournament, overcame his recent disappointments to reach the main draw in Sofia. After dismissing Serbia’s Laslo Djere in the first round, the Italian set up an encounter with Marton Fucsovics. The encounter was an easy task for the 2007 French Open boys doubles champion as he won six consecutive games during his 6-4, 6-1, victory. All of the qualifiers are capable of making runs given this open field.